Senate Republicans appear set to vote on their tax bill this week after it cleared both the Senate Finance and Budget Committees. Despite incessant claims earlier this year that they would provide a “middle-class tax cut,” the actual details of their plans show quite the opposite. According to the Tax Policy Center (TPC), in 2027 taxes would be raised slightly on average for the bottom 40 percent. According to the Joint Committee on Taxation, in 2027 households making under $75,000 would see their taxes increase on average. These increases on the bottom 40 percent would help finance very large tax cuts for the richest households and big corporations. 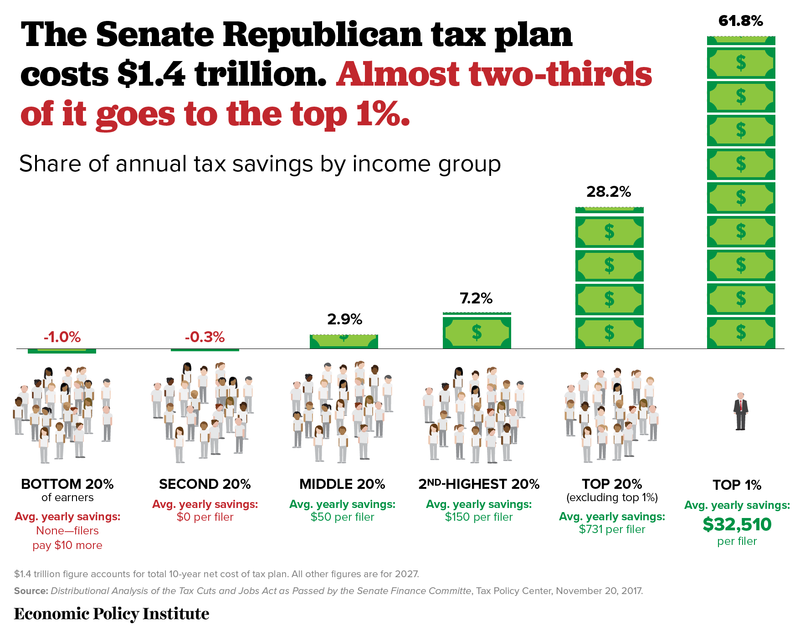 As the figure below shows, TPC finds that in 2027 the Senate tax plan delivers 62 percent of its benefits to the top 1 percent, households that currently have income of $730,000 or more. And even the small average tax cut found by TPC for the middle 20 percent of households obscures something important: 66 percent of these households in the middle 20 percent will actually face a tax increase in 2027. Compare that to the 83 percent of households in the top 1 percent of earners and 98 percent of households in the top 0.1 percent of earners that will get their taxes cut. This isn’t a “middle-class tax cut.” This is a tax cut for the rich and big corporations at the expense of working families.